Dr. Karen Lord Rutter is a retired teacher and administrator with over 30 years in education whose work with students ranged from preschool through high school. Dr. Rutter is known as an education innovator and has won many awards and accolades during her career as a National Board Certified Teacher. She was selected as one of the top 20 teachers in America by USA Today in 2000, and was twice chosen by her peers as Teacher of the Year. In 2004, she was honored with the University of Georgia, College of Education Distinguished Alumni Award. Dr. Rutter has been chosen as a professional delegate to study education in China and Brazil as well as a Fulbright Delegate to study education in Japan. She is an avid reader who believes that books open the windows to the world. Dr. Rutter has a passion for travel, children, animals, and perpetual learning. Her first novel was inspired when her son, David, thru-hiked the Appalachian Trail with the family dog, Copper. Her love of the Appalachian Trail was born after David invited her to hike a few sections of the A.T. as he progressed on his journey. From those Appalachian Trail adventures with Copper and David, Northbounders was born. With deep roots as an educator, she incorporated history, geography, science, math, and enriched vocabulary into Copper and David's story. The Appalachian Trail begins in Georgia, the state where Dr. Rutter was born and has made her home. As an energetic child in East Dublin, Georgia, her parents encouraged her to dream, travel, and experience life. Raised by a mother who was a talented homemaker and a father who supported the family with an upholstery and furniture refinishing business, Dr Rutter learned the value of hard work and the joy of family. Love, respect, friendship, and family were the cornerstones of the home. Education was a part of everyday conversations, so it is no surprise that Dr. Rutter is a proud alumni of both Georgia Southern University and The University of Georgia. She and her husband, Mike, have two adult children, David and Mikella, who are both talented writers. David served as the editor of Northbounders while Mikella inspired the cover art and title. 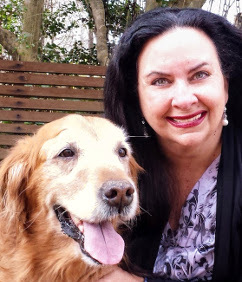 Dr. Rutter's book is a labor of love for another family member, a Golden Retriever, who taught the family about love, loyalty, perseverance, and unbreakable friendship. I was born on March 8 just around midnight in Dublin, Georgia. Sort of. There were only 5 in my immediate family: my mom, dad, and two sisters. But, my extended family was huge! My dad had 16 brothers and sisters and my mother had 6 brothers and sisters all of whom had families of their own, so there were always cousins to play with. I went to public schools in East Dublin, Georgia. My high school was East Laurens High, home of the mighty Falcons! My college years were spent at Georgia Southern University and the University of Georgia. Were you involved in extracurricular activities at your high school? Yes. I played all available sports: basketball, softball, tennis, track, cheerleading, and even powderpuff football a few times. I was involved in lots of student organizations like Beta Club and FHA (now FCCLA) and was an overall A student. I loved going to school and participating in any activity that I could. I had several, but the ones who influenced my life the most were my coach and my home economics teacher. They gave me life skills that I still use today. Yes, I had 2 cats, one named Tinkerbell and the other Twinkles. We also had a few goldfish. I was an energetic child; my mom named me "the white tornado". Sometimes I would get on her last nerve with all my energy, and she'd send me out to play or visit my dad in his upholstery shop next door to our house. In spite of this, I was a very kind, sweet, and loving child who adored my sisters and parents. (I still do.) I enjoyed creating and was blessed to have parents who fostered that desire. Biographies. I loved learning about history and historical figures like Clara Barton, Betsy Ross, Thomas Jefferson, and George Washington. I wanted to know about each from childhood to adulthood. Summers were my favorite time to read. The book-mobile (think food truck, but with books) came around every two weeks, and I couldn't wait to get my hands on new books to read. My favorite color is blue except during football season when they're red and black, the colors of the Georgia Bulldogs! Now, you've stumped me. I have no idea. There are so many good things to eat! Singing, playing guitar and piano, traveling, and of course, writing. Rude and inconsiderate people who hurt others. There is no place in my world for unkindness. What is your favorite place in all the world? Anywhere my family is all together. Is there anything unusual about you? I'm sure there is...just don't tell me, okay?